To many people, an induction of labour might seem like a simple process. One where you turn up to hospital, have a ‘drip’ put in, contractions get going and you have a baby – just like you would naturally. Unfortunately, many women are experiencing inductions of labour that end up failing. And because the labour process has been started, further interventions or a c-section are required to birth the baby. A US study looking at 7800 first time mothers found those who had their labour induced were twice as likely to need a c-section compared to women who went into labour spontaneously. What Is An Induction, Exactly? An induction causes labour to begin artificially, before it has started on its own. Labour begins when your baby’s lungs secrete a hormone which signals to your body he is ready for the world outside the womb. Read more about what causes labour to start. This process kickstarts labour – your cervix begins to ripen and your uterine muscle begins to contract, opening the cervix. There are more than a few methods of induction but the most commonly used is with artificial oxytocin (known as Pitocin in the US or Syntocinon in Australia). All methods of induction rely on your body being ‘tricked’ into thinking it’s time to go into labour. You can read more about the different methods of induction here. Don’t Inductions Work Every Time? How many times have you heard of a woman being induced with medications, only to end up with a c-section for failure to progress or fetal distress? This is not a rare occurrence, it happens a great deal of the time. In the United States, around 25% of births are induced and around 30% of births are c-sections, mostly emergency (which simply means occurring after labour has already begun). Australia (and other countries) have similar rates. Often after this situation occurs, these women are told their bodies probably just failed and the same thing may happen the next time. Some women are even told it’s a good thing they were in hospital, because they were able to save their baby. After all, doesn’t labour after induction just kick along until a baby is born? Think about a flower bud. If it’s tightly furled, trying to peel back the petals to get to the middle is pretty tough. You have to pull petals off each layer and then there is a damaged flower bud left. If the bud has opened a little in preparation for blooming, you might have more luck with encouraging the petals open. You’re less likely to cause much damage to much of the flower. Induction is the same process. If your baby and body aren’t ready, it’s going to be much harder and less successful to get labour going. The Bishop’s Score can determine how likely an induction will be successful. So Why Do Inductions Fail? Imagine your body as the flower bud, tightly furled and wrapped around your baby, who is still putting on the finishing touches to lungs and brain development in order to survive outside the womb. During your third trimester of pregnancy, the number of oxytocin receptors in your body increase significantly. When your baby signals readiness for birth, oxytocin is released into your bloodstream and acts like a ‘key’ to unlock the oxytocin receptors. It’s these receptors that are responsible for signaling to your uterine muscles to contract and dilate the cervix. Oxytocin is released in a pulsing wave, allowing contractions to build in time and intensity. As your labour progresses, a natural feedback system is in place, stimulating more production of oxytocin, ending in the birth of your baby. When labour is induced with artificial oxytocin, large amounts may be needed to stimulate oxytocin receptors, especially if you are not close to going into labour spontaneously. Flooding the system with an artificial form of oxytocin means the oxytocin receptors are overwhelmed and can’t respond to the normal feedback your body would have. 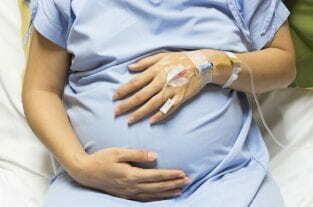 The artificial oxytocin drips may be turned up higher, causing intense painful contractions. Babies often don’t respond well to the increased pressure of these contractions. Women may request an epidural due to the pain of the intense contractions or their bodies stop responding to the artificial oxytocin. The usual result is a c-section. If induction fails, women are often left with the feeling their body didn’t do what it was supposed to. They are left coping with the effects of an interventive birth and feel perhaps they just can’t go into labour effectively and worry about what will happen next time. Women’s bodies are biologically designed to grow and protect their babies until birth. When your baby is ready to survive outside your uterus, your body responds by starting the process of labour. When induction fails, it is most often because your baby wasn’t ready to be born and your body hadn’t had the signal it was expecting to get ready. Induction interferes with the normal process your body is expecting and either doesn’t respond well or refuses to cooperate. My due date was on 9th july, i was induce on12th and it Labour began but did not progress, on 15th I took drip but nothing happened. On 20th i took castor oil still no show and now it seems the only option left is cs if no miracle of natural contraction till 23rd.